Skyler B., a 17-year-old girl who resides in Orlando, Florida, has expressed her longtime love of Star Wars by creating highly detailed costumes from a galaxy far, far away. She and her mother share their passion for Star Wars and celebrate their fandom together through cosplay. For as long as she can recall, Skyler has been a Star Wars fan. The Phantom Menace and A New Hope were two of her favorite movies to watch while growing up. Star Wars played a huge part in her life from a young age as she played with action figures, video games, and creating her own costumes. Skyler and her brother at Disney's Star Wars Weekends when she was only six years old. Her costume endeavors started in May 2013 when she received tickets to her first convention, Philadelphia Comic Con, for her fourteenth birthday. She was new to the world of cosplay, but decided to piece together a costume of Chell from Portal 2. During the convention, she was surprised that people asked to get photos of her, since she had never experienced a sci-fi convention before. In November of 2014, she started creating large scale costumes and diving head first into the world of cosplay. 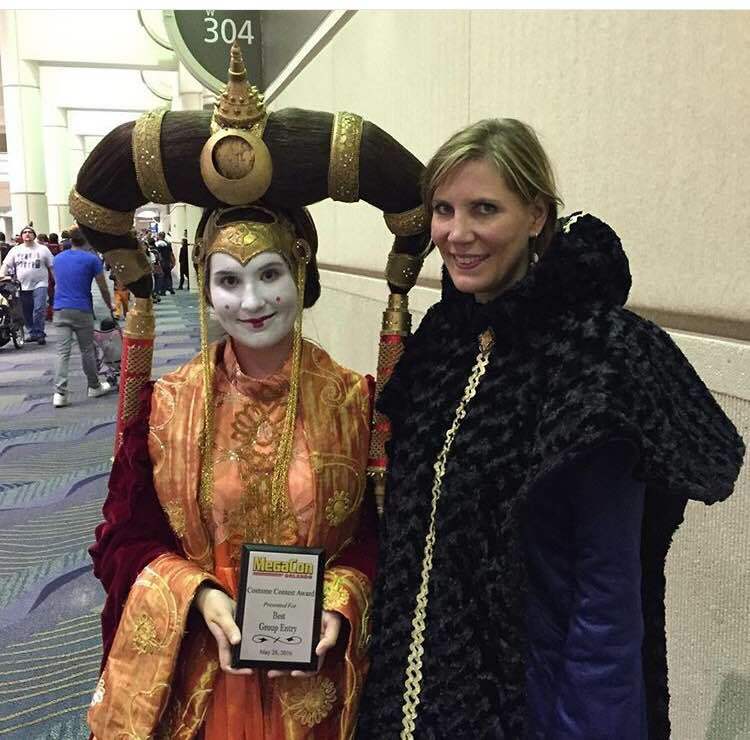 Skyler debuted her handcrafted Queen Amidala's senate gown at MegaCon in May 2016. This beast of a costume was started in November 2015 and took over 100 hours of work- 40 of which were completely dedicated to the headpiece alone. 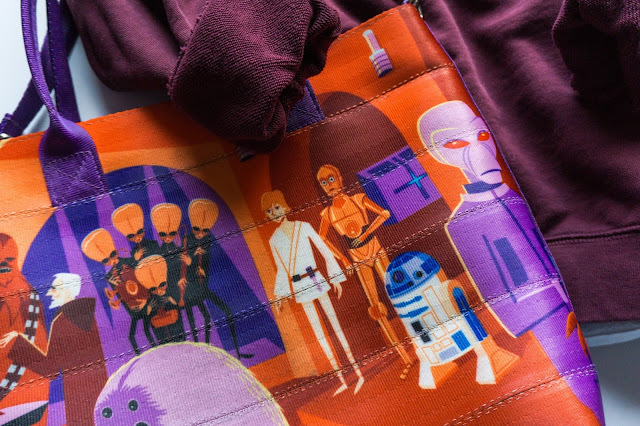 She found that searching for reference images was difficult, but eventually found resources like Padawan's Guide, The Rebel Legion, and Dressing a Galaxy: The Costumes of Star Wars by Trisha Biggar to use for this project. Skyler's beautiful creation of Queen Amidala's senate gown. "The largest obstacle I ran into while making the costume was the amount of non-purchasable fabrics, trims, and accessories. A lot of the cosplay had to be hand created- including the ruched panels on the back and sides, roses on the back, orange-gold trim fabric, braided gold trim, beading on the under dress, and the pleated panel of the under dress," explains Skyler. 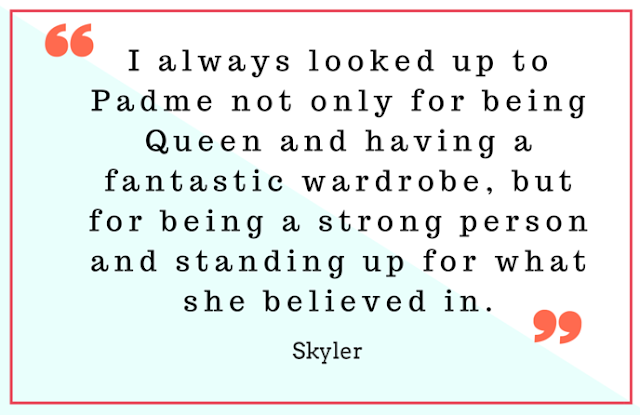 Some of Skyler's other Star Wars costumes include Queen Amidala's Theed throne room gown from The Phantom Menace and Padme's torn Geonosian outfit from Attack of the Clones. Adrienne, Skyler's mom who also dresses up from time to time, has been a Star Wars fan ever since she saw original trilogy as a child. She sometimes helps Skyler with her enormous costume projects. When they worked on Amidala's senate gown, they wrestled over 10 years of velvet through the sewing machine together. She treasures the time they spend together on such a fun and creative hobby. "Cosplaying with my daughter is always a fantastic experience and I can honestly say it's been one of my favorite things to do. 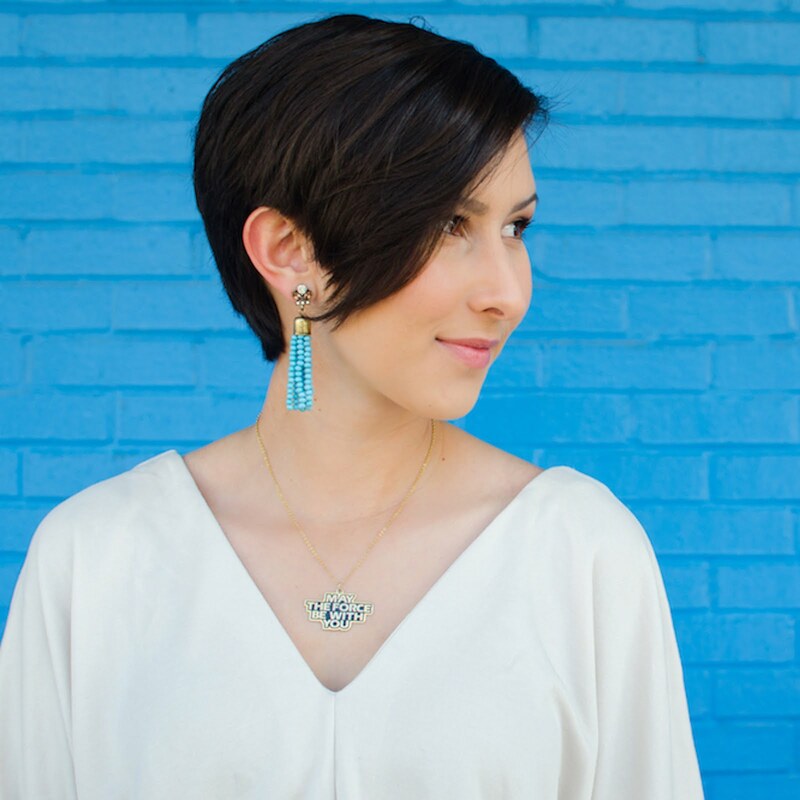 Even though we've been doing this for a relatively short time, we've already created so many happy, funny, and crazy memories," says Adrienne. Skyler and her mom Adrienne after winning Best Group Entry in MegaCon 2016's costume contest. Skyler's future costume plans include Sabe's black decoy gown from The Phantom Menace, Padme's lake dress from Attack of the Clones, and possibly Padme's meadow dress from Attack of the Clones. She's also looking forward to the new Star Wars films and hopes to one day create a costume from the new movies. To see photos of the cosplay creating process and follow more of Skyler's costuming adventures, follow her on Instagram @SkyCosplays. Skyler in her Queen Amidala Theed throne room cosplay. Photo by Eddie Brown- Papanotzzi. All photos used with permission and courtesy of Skyler B.